Will this make the nightly news? A battle raged Thursday in west Baghdad after residents rose up against al-Qaida and called for U.S. military help to end random gunfire that forced people to huddle indoors and threats that kept students from final exams, a member of the district council said. Thanks to the Left’s neurotic hatred of Israel, we now have the extraordinary sight of self-styled liberal campaigners launching McCarthyite witch-hunts against anyone deemed to have Israeli connections, as in this week’s debate at the University and College Union’s annual conference at Bourne­mouth calling for a boycott of all Israeli academic institutions. Respect for democracy, individual rights and freedom of speech are being crushed beneath the juggernaut of shrill indignation. What is particularly disturbing is the way opposition to the Jewish state descends into vicious antagonism against Jews themselves, as shown by this sickening recent outburst from writer Pamela Hardyment, a member of the National Union of Journalists, which in April voted to boycott Israeli goods. Explaining her support for the NUJ’s stance, Ms Hardyment described Israel as “a wonderful Nazi-like killing machine backed by the world’s richest Jews”. Such words could have come straight from Hitler or the most fervent supporter of Osama Bin Laden. Westminster City Council is doing its bit to save the planet by installing energy-saving street lamps in every thoroughfare in the borough, the BBC reports. The bold initiative follows a "successful trial" of the £1,000-a-pop Furyo Lanterns on Harrow Road which saved "on an average day", enough juice to light a house for two days and cut carbon emissions on the test highway by 0.28 tonnes over three weeks. The bulbs in question apparently "reflect light in a much stronger way meaning low wattage bulbs can be used" and boast "solar microchips" which flick on the switch as required, replacing the traditional timer. Councillor Alan Bradley of Westminster Council trumpeted: "Not only will these lights make a significant difference to the environment, but they save money too. These changes are vital and will help preserve our heritage and the city for everyone to enjoy for generations to come." So far so good. However, the Beeb says that if Westminster replaces all of its 29,000 street lights, it will save "up to £20,000 every year". Since the cost of the new, whale-hugging illumination is £29m, it will therefore recoup its outlay in a mere 1,450 years. No one really wants to limit their CO2 emissions...so why should we? INDIA says it will reject proposals to limit greenhouse gas emissions at a summit meeting of the world's leading economies next month because stricter limits would slow its booming economy. “Legally mandated measures for reducing greenhouse gas emissions are likely to have significant adverse impacts on GDP growth of developing countries, including India,” environment ministry secretary Pradipto Ghosh said. “This in turn will have serious implications for our poverty alleviation programs,” he said. Since 1970, the year of the first Earth Day, America's population has increased by 42%, the country's inflation-adjusted gross domestic product has grown 195%, the number of cars and trucks in the United States has more than doubled, and the total number of miles driven has increased by 178%. But during these 35 years of growing population, employment, and industrial production, the Environmental Protection Agency reports, the environment has substantially improved. Emissions of the six principal air pollutants have decreased by 53%. Carbon monoxide emissions have dropped from 197 million tons per year to 89 million; nitrogen oxides from 27 million tons to 19 million, and sulfur dioxide from 31 million to 15 million. Particulates are down 80%, and lead emissions have declined by more than 98%. • The number of days the city of Los Angeles exceeded the one-hour ozone standard has declined from just under 200 a year in the late 1970s to 27 in 2004. • The Pacific Research Institute's Index of Leading Environmental Indicators shows that "U.S. forests expanded by 9.5 million acres between 1990 and 2000." • While wetlands were declining at the rate of 500,000 acres a year at midcentury, they "have shown a net gain of about 26,000 acres per year in the past five years," according to the institute. A Two-Year Battle in Lebanon??? I predict the Lebanese will completely obliterate the terrorists - doing what the Israelies should have done to Hezbollah. Islamic fighters in the siege at Lebanon's Nahr al Bared refugee camp claim to have spent months digging underground bunkers ahead of a battle they promise will last "two years or more". In an echo of last summer's war in Lebanon, when Hezbollah fighters used tunnel networks to inflict casualties on Israeli troops, militants at the camp north of Beirut say they have dug in for guerrilla combat with the Lebanese army. Shihab al-Qaddour, the deputy leader of the Fatah al Islam group, promised that his band of several hundred "battle-hardened" fighters had built extensive subterranean fortifications. "We are prepared for a battle that will last two years or more," he said in an interview with the London-based Al Hayat newspaper. "We are ready to blow up Beirut and every other place in Lebanon." When will the Palestinians learn that they will have to learn how to live in peace...amongst themselves and with their neighbors? The armed Palestinian organizations in the Gaza Strip are demonstrating once again what has become a norm among the Palestinians - that the agreements to which their leaders commit have no value. It's enough just to listen to Palestinian citizens complaining about how the cease-fire agreements there have no meaning. Agreements are made and signed, and immediately violated. In this latest round of violence, the warring parties have already decided on a cease-fire five times. Each time, within hours, they were back to killing each other and injuring bystanders in the process. If this is how they behave among themselves, why should they be any more scrupulous in abiding by agreements with outside elements such as Israel, Jordan, Lebanon or Egypt? This is an important lesson that Israel must learn from the recent events in Gaza. The phenomenon did not originate in Gaza. During the civil war in Lebanon in the 1970s and '80s, the Palestinians agreed to and signed more than 90 cease-fires. Most were violated with terrible bloodshed. The desire to be rid of the Palestinians was the reason that many Shi'ites welcomed the IDF forces that entered Lebanon. The goal of stopping Palestinian unruliness was also one of the reasons behind Hafez Assad's invasion of Lebanon. In Jordan, the Palestinians continued to violate the agreements they reached with King Hussein until he sensed that the government was slipping from his hands. There, too, they caused a civil war in which they were beaten by the Jordanian army. The peak occurred not long ago, when the Palestinians crudely violated the Mecca agreement for the establishment of a Palestinian unity government even before the ink was dry. The descendents of refugees are leaving their refugee camp in Lebanon. The stream of Palestinians flowing out of the Nahr al Bared refugee camp on this city’s outskirts continued Wednesday, as the Lebanese Army reinforced its positions and vowed to crush the militants inside. By late Wednesday, about 15,000 refugees had left the camp, the Red Cross said, piling into buses, pickup trucks and cars. Some walked out, still shaken by the four-day conflict between the Lebanese Army and Fatah al Islam, a militant Palestinian group. Don't people wonder why there's a refugee camp in northern Lebanon. Why the descendents of Palestinian refugees are being made to languish for decades in a camp? Is it any wonder they are full of hate??? These people should be resettled in the Arab world...instead of waiting for their dream of living in Israel. Global emissions of the main gas scientists link to global warming will rise 59 percent from 2004 to 2030, with much of the growth coming from coal burning in developing countries like China, the U.S. government forecast on Monday. There's no reason for us to spend billions of useless dollars trying to control a gas that is not a pollutant. If the earth is warming, let's just adapt to it. China, India..and now Brazil aren't playing the game of Kyoto...so, why should we? Brazil appears to be about to pass over a prime opportunity to affirm itself as a leading environmental power in negotiations to bring the threat of global warming under control, according to environmentalists and analysts. Crowned with the dubious honour of being one of the five countries that produce the most greenhouse gases, Brazil is unique in that three-quarters of its emissions of these gases are due to deforestation. A drastic reduction in deforestation could be achieved simply by enforcing what is already official policy: that is, stemming the advance of agricultural and mining activities as they illegally encroach on the Amazon rainforest. gets, which so far are compulsory for only 35 industrialised countries. Israel's U.N. ambassador on Monday accused moderate Muslim and Arab leaders of standing by in "eerie silence" while Islamic extremists terrorize people around the world. "We live in a world where when Christians kill Muslims, it's a crusade. When Jews kill Muslims, it's a massacre. When Muslims kill Muslims, it's the weather channel. Nobody cares," Ambassador Dan Gillerman told reporters at a press lunch at the Waldorf-Astoria hotel in New York. 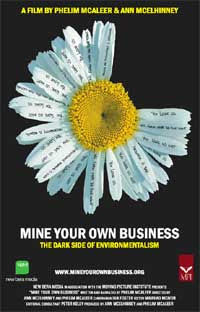 On May 29, 2007, Ottawa will have opportunity to see the powerful new film, "Mine Your Own Business", a film about the dark side of environmentalism. The film screening, at the Ottawa Public Library, is sponsored by the Free-Thinking Film Society, (formerly the Conservative Film Society), a new organization that plans to regularly bring in films of a Libertarian/Conservative bent. "Mine Your Own Business" exposes the dark side of environmentalism. The documentary hacks away at the cozy image of environmentalists' as well meaning, harmless activists. *Mine Your Own Business* is the first documentary which asks the hard questions of foreigners who lead campaigns to "save" remote areas from development. Their answers are often disturbing, with racist overtones, but we, in the west, blindly support such campaigns that want to keep people in poverty. Now for the first time "Mine Your Own Business" asks local people about their lives and what they want for the future. Their answers are very often different from what the foreign environmentalists say and what is reported in the mainstream international media. "Mine Your Own Business" is a journey through the dark side of environmentalism. It demolishes the cozy consensus that environmentalists are well meaning agenda free activists and shows them to be anti-development ideologues who think the poor are happy being poor and don't want the development that we, in the west, take for granted. "Mine Your Own Business" goes beyond the voice of the foreign environmentalists that we so often hear in the media and meets those who will be most affected by these projects and the well-run campaigns against them. "Mine Your Own Business" follows George, a 23-year-old unemployed miner from northern Romania whose life has been put on hold after an anti-mining campaign orchestrated by foreign environmentalists. George explains his hopes and dreams for the future - which are different from those prescribed for him by foreign environmentalists. He then travels to other impoverished communities in Madagascar and Chile who are also desperately waiting for large mining projects. George finds people similar to himself with similar hopes and dreams of a decent job and house and a decent education and better life for their children. Next stop...the statue of liberty? The Little Mermaid statue in Denmark's capital was found draped in Muslim dress and a head scarf Sunday morning, police said. After receiving a telephone call, officers drove to the site and removed the garments, said Copenhagen police spokesman Jorgen Thomsen. The Little Mermaid was created by Danish sculptor Edvard Eriksen in tribute to Danish storyteller Hans Christian Andersen. Sitting on a rock at the entrance of Copenhagen harbor since 1913, she draws an estimated 1 million visitors a year, and is occasionally targeted by vandals. Can't wait to see this museum! Its economy is crumbling and its people are struggling to survive in the face of nearly 4,000 per cent inflation, food and fuel shortages and the prospect of power cuts for up to 20 hours a day. Yet Zimbabwe's president, Robert Mugabe, is spending £2 million on perhaps his most grandiose project yet - a monument to himself. Work has already begun on a museum, dedicated to the life and dubious achievements of the 83-year-old president, in his home district of Zvimba, 65 miles west of the capital, Harare. "As we speak right now, ground work for the construction of the museum is at an advanced stage," a government minister said. "The president wants the project to be speeded up so he can open it next year, possibly after winning the [presidential] elections." What's this? Global warming guru Al Gore caught on tape refusing to endorse the Kyoto accord? Yep. In his recent special, Exposed: The Climate of Fear, CNN's Glenn Beck showed some priceless footage of then vice-president Gore explaining in 1997 why he didn't support U.S. participation in the Kyoto accord. "We will not submit this (Kyoto) for ratification until there's meaningful participation by key developing nations" Gore said. Problem is, Kyoto required nothing of developing countries such as China and India when Gore made that statement 10 years ago, doesn't require anything of them now and won't require anything of them before it expires in 2012. "That's the Gore standard. That standard still has not been met. That was the standard George Bush articulated, too, but he's mean." Can we make him Prime Minister? The Czech President is the type of leader we need.....can't wait to get his book. Czech President Vaclav Klaus on Wednesday denounced environmentalists' "hysteria" over global warming as he launched his latest book, "A blue, not green, planet," which tackles the issue. "I am raising my voice," said the politician who has characterised environmentalism as an ideology as dangerous as communism. "Can we allow certain political movements that want something else other than liberty to profit from an hysteria which has been born?" Klaus asked. "Above all, it is necessary to determine if the impact of man on global climate change is such that it justifies this hysteria," he added. Klaus, as well as being a well known eurosceptic and a fan of former British premier Margaret Thatcher, has now lined up alongside the US sceptics in the climate change debate. During the presentation at Prague's Slavia Cafe in Prague, a favourite haunt of intellectuals, Klaus called for a rational debate over climate change. He called on the public to "open its eyes faced with a dangerous manipulation" by those who, according to him, want to "limit free thinking and decision making." University of Washington climate scientist Mark Albright was dismissed on March 12 from his position as associate state climatologist, just weeks after exposing false claims of shrinking glaciers in the Cascade Mountains. Seattle Mayor Greg Nickels (D) had asserted in a February 7 Seattle Times editorial, "the average snow pack in the Cascades has declined 50 percent since 1950 and will be cut in half again in 30 years if we don't start addressing the problems of climate change now." Albright knew from his research that the Cascade Mountains snow pack had not declined anywhere near what Nickels asserted, and that the snow pack has actually been growing in recent years. Albright sent emails to his colleagues informing them of the factual data. At most, according to reliable datasets, the Cascade Mountains snow pack declined by 35 percent between 1950 and 2000. Moreover, even that number is misleading. Nickels and other global warming alarmists deliberately choose 1950 as the "baseline" for Cascade Mountains snow pack because 1950 was a year of abnormally heavy snowfall resulting in an uncharacteristically extensive snow pack. Albright noted in his emails the current snow pack is only marginally lower than the long-term average since 1943. Moreover, the Cascade Mountains snow pack has been growing since the late 1970s. CTV Ignores Rockets Firing into Israel.. The Palestinians fired over 20 rockets in Israel yesterday from Gaza. You'd think that would be news on CTV last night....but not one word. They talked about the violence in Gaza, but forgot to mention all the rockets, and the fact that people were wounded. A Jewish couple is running away from Amsterdam, after years of being victimized by Moroccan neighborhood terror. They're scared to death. For almost nine years the lives of Loes and Nico Vet had been turned into hell. Swastikas and Arabic slogans scratched on the door, soiled car, slashed tires, attempt at breaking in and windows broken by iron pipes and stones thrown in. Sixty year old Nico says they couldn't handle it any more and have given up. "We couldn't like like this any longer. Or maybe we should wait till a firebomb comes flying in? We want away. Away from Amsterdam! Preferably as quick as possible, because we're close to a breakdown." A terror suspect accused of a plot to commit mass murder with the poison ricin was last night freed to claim asylum. A special immigration hearing ruled Moloud Sihali could not be kicked out on national security grounds. The Algerian could be granted asylum. After losing yesterday's case the Home Office had to consider a claim for refugee status made by Sihali shortly after his 2003 arrest, said immigration sources. Sihali served a 15-month jail term for having false passports. He is likely to receive free housing and benefits while the outcome of his asylum claim is decided - despite the fact that he sneaked into Britain illegally as long ago as 1997, using a false passport. The Special Immigration Appeal Commission heard evidence linking Sihali to international terror suspects, including Mohamed Meguerba. He was first arrested in September 2002 and tried for allegedly being part of a terror cell which planned to use the poison ricin to murder dozens in London. Sihali and three fellow Algerians were cleared of the plot. Their co-defendant, Kamel Bourgass, also Algerian, was convicted of killing Detective Constable Stephen Oake in a raid connected to the plot, and conspiracy to cause a public nuisance. He was jailed for life. Following the July 7 attacks in 2005 the Home Office said they wanted Sihali out of the country to protect national security. Home Secretary John Reid said Sihali had provided "active, if undiscriminating, assistance to terrorists in the past" and there is a "real risk" he will do so again. A radical plan by Al-Qaeda to take over the Sunni heartland of Iraq and turn it into a militant Islamic state once American troops have withdrawn is causing alarm among US intelligence officials. A power struggle has emerged between the self-styled Islamic State of Iraq, an organisation with ambitions to become a state which has been set up by Al-Qaeda, and more moderate Sunni groups. They are battling for the long-term control of central and western areas which they believe could break away from Kurdish and Shi’ite-dominated provinces once the coalition forces depart. According to an analysis compiled by US intelligence agencies, the Islamic State has ambitions to create a terrorist enclave in the Iraqi provinces of Baghdad, Anbar, Diyala, Salah al-Din, Nineveh and parts of Babil. The US conviction that the Islamic State could seize power is based on its use of classic Al-Qaeda tactics and its adoption last October of a draft constitution. This was entitled Notifying Mankind of the Birth of the Islamic State and was posted on a website based in Britain. The group named 10 ministers under its emir, Abu Amer Al-Baghdadi. They included a war minister, Abu Hamza Al-Muhajer who is also known as Abu Ayub al-Masri and is Al-Qaeda’s commander in Iraq. Hamas, the extremist Palestinian organisation, has been denounced as “pure evil” for creating a television show in which a Mickey Mouse-style character calls on children to help Muslims become the “masters of the world” and violently resist Israel. The al-Aqsa television station run by Hamas began running the show, Tomorrow’s Pioneers last month. 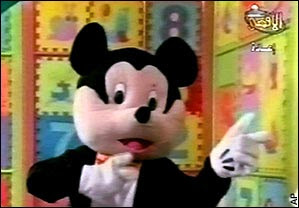 It is hosted by Farfour, who dresses in a Mickey Mouse suit, and an a young female assistant, Saraa. Farfour then tells the child that becoming “masters of the world” requires everyone to be happy with Arabic, which “once upon a time ruled this world”. In another clip, which has appeared on YouTube, a viewer speaking to Farfour by telephone recites a poem referencing an AK47 assault rifle. As the poem is read out, Farfur pretends to shoot a rifle. Another child tells Farfour: “It is the time of death, we will fight a war”. According to an audio clip obtained yesterday by the Citizen, the activists issued the call at a public meeting April 27 in Toronto at which Canadian delegates reported on their experiences at the March 29 to April 1 Cairo Conference. The participants included representatives -- some quite senior -- of four Islamist groups listed as terrorist organizations by the Canadian government, including Hamas and Hezbollah. In an interview, David Harris, a terrorism expert and former chief of strategic planning for the Canadian Security Intelligence Service (CSIS), said it was "absolutely extraordinary" that antiwar groups would align themselves with radical Islamic groups. "At the very least, people associated with the organizations connected with this should feel mortified and horrified," he said. The 90-minute meeting on April 27 at the Steelworkers' Hall on Cecil Street in downtown Toronto was chaired by James Clark of the Toronto Coalition to Stop the War, who was one of the delegates at the Cairo meeting. Seven other delegates also presented reports. According to the audio recording, several talked about how "resistance movements" in the Middle East are keen to improve relations with antiwar and leftist groups in the West. "What we saw in Cairo were the first signs that a world movement is beginning to come together," Suzanne Rice, one of the Canadian delegates, told the gathering. A number of speakers urged audience members to sign up for next year's Cairo conference so an even larger Canadian delegation could attend. "We have to forge a more solid and more united anti-imperialist and anti-Zionist movement here to be able to have something to show our brothers and sisters when we get back," said one speaker. Schools with mainly white pupils will be forced to send their children to mix with other races and religions. A legal duty for schools to promote community relations comes into force in September. Government guidelines to help them comply could require staff to take children on visits to multi-ethnic schools, stage joint plays and sporting events or twin with other schools. Ministers said some suburban teenagers had never met a Muslim or Hindu and needed more contact. Ofsted, the schools watchdog, will be given the power to force schools to comply. Those who do not risk being consigned to a failing list. Let's be honest - they aren't going to cut their emissions...neither are the Indians..or the Americans...so, why should we? Beijing has begun to adopt a more assertive role in global climate change negotiations to head off the development of a regime which it worries could force it to cut emissions and scale back its economy. China's aggressive posture was on display this week at a UN meeting on climate change in Bangkok, when Beijing's representatives tried to ensure the conference communiqué specifically blamed industrialised nations for global warming. In recent weeks, China has led an alliance of developing countries disputing the right of the UN Security Council to debate climate change and has suggested the country's one-child policy should be credited for ameliorating the situation by keeping down the world's population. Beijing's fears of being targeted on climate change were heightened by the statement late last month by an official of the International Energy Agency that China could become the world's largest emitter of greenhouse gases as early as this year. Any money we spend on lowering our emissions will just be wasted. We need to spend our money on adapting to a warmer climate. The Church of England favours appeasement..
Oh, yes..if not for British foreign policy, there would be no radical muslims...the Church of England is deluded in its naivete. Shame on them. British Muslims have been radicalised by the Government's disastrous policies in the Middle East, claims the Church of England. In a scathing critique of foreign policy under Tony Blair, the church condemns the "litany of errors" made in Iraq, adding that Britain's image abroad has been tarnished and it stands isolated in Europe because of its subservience to the United States administration. It hopes that a change of leadership will be followed by a change in approach. Rowan Williams, the Archbishop of Canterbury, has endorsed the report, which says that the country is being turned into a hotbed of terrorist recruitment because of the occupation of Iraq and the Government's pursuit of "unfair" and "unjust" policies in the region. 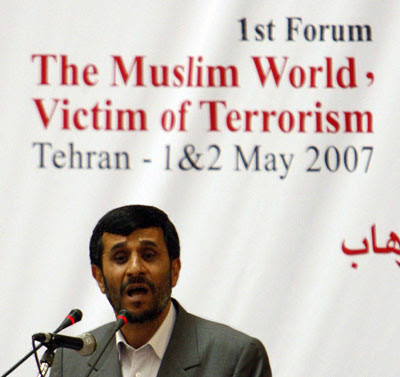 Rather than help to fight fanaticism, Britain's participation in the "war on terror" has provided al-Qaeda with propaganda to attract Muslims opposed to the idea of Western hegemony being foisted upon the Middle East. "Arguably the greatest impediment to prospective gains in the 'war on terror' is the galvanising effect the Iraq occupation has had on terrorist recruitment, morale and capability," the document says. "The radicalisation of some sections of European Muslim society... has been confirmed and intensified by the ongoing occupation of Iraq. The war has given an opportunity to radical Muslims, in Europe and in the Middle East, to attach their own local particular concerns onto a wider global contest." The document, submitted to the Foreign Affairs Committee's inquiry on global security, warns that mistakes made abroad are having negative consequences domestically. "The growing links between domestic and international issues means that British foreign policy to the Middle East impacts as much upon the UK's well being as it does on the security and prosperity of the Middle East." It says that foreign policy in the region is widely seen as "far from even-handed, fair and just" and cites its lack of action over the war in Lebanon. And that war in Lebanon? How dare the British not support Hezbollah? Is that who the Church of England would have us support? This was confirmed by the March 2006 elections, in which immigration — incredibly — was a minor issue. Five years ago, Fortuyn inspired widespread hope and determination. Today, all too many Dutch citizens seem confused, fearful, and resigned to gradual Islamization. No wonder many of them — especially the young and educated — are emigrating to places like Canada, Australia, and New Zealand. Yes, some politicians, notably Parliament member Geert Wilders, are carrying on Fortuyn's battle. But momentum has given way to malaise. Politicians and journalists who once kept mum on Islamization now openly defend it as preferable to culture clash: Amsterdam mayor Job Cohen has called for "accommodation with the Muslims," including toleration "of orthodox Muslims who consciously discriminate against their women." Only last week, Mr. Wilders was called in by Dutch intelligence and security officials who, he said, "intimidated" him by pressuring him to tone down his rhetoric on Islam. Fortuyn's brief shining moment seems very long ago. Many political assassinations leave behind haunting questions. How would Reconstruction have gone under Lincoln? Could the Vietnam debacle have been avoided if President Kennedy had lived? Five years after Fortuyn's murder, it can feel as if Volkert van der Graaf robbed Europe not only of a brilliant champion of liberty, but of its one great chance to save itself before it's too late. Is this a hoax or what? Bigfoot, the legendary hairy man-like beast said to roam the wildernesses of North America, is not shy, merely so rare it risks extinction and should be protected as an endangered species. So says Canadian MP Mike Lake who has called for Bigfoot to be protected under Canada's species at risk act, alongside Whooping Cranes, Blue Whales, and Red Mulberry trees. "The debate over their (Bigfoot's) existence is moot in the circumstance of their tenuous hold on merely existing," reads a petition presented by Lake to parliament in March and due to be discussed next week. "Therefore, the petitioners request the House of Commons to establish immediate, comprehensive legislation to affect immediate protection of Bigfoot," says the petition signed by almost 500 of Lake's constituents in Edmonton, Alberta. How's this for a conference? Belgian MEP Véronique De Keyser has told a group of her peers how she feels like she wants to “strangle” Israeli diplomats who discuss Israel’s security. Addressing a European Left Group hearing on the situation of Palestinian political prisoners last week, De Keyser deplored the “passivity” of the European Parliament on the Palestinian issue, and hailed the “moderation and maturity” of the Palestinians. A 45-year-old Jewish man was stabbed in front of a kosher restaurant in the city of Villeurbanne, southern France on Tuesday in what authorities believe to be the latest in a series of anti-Semitic attacks in the country. The victim, who is only being identified as "Eric", was rushed to hospital in the neary city of Lyon after suffering injuries on his left shoulder. The attack occured around lunch time as he parked the car while his family went into the restaurant. A few minutes later he entered the restaurant covered with blood, saying he had been stabbed by a young man on a bicycle. Conservatives continue to get far more donations than the Liberals.. Cause for a celebration - the Liberal fund-raising machine is broken! The evidence was good enough: not conclusive, but why wait until we are absolutely certain when we apparently need to act now? So the idea that carbon emissions were causing global warming passed from the scientific community into the political realm, and actions started to happen. . . . The political realm in turn fed money back into the scientific community. By the late 1990's, lots of jobs depended on the idea that carbon emissions caused global warming. Many of them were bureaucratic, but there were a lot of science jobs created too. I was on that gravy train, making a high wage in a science job that would not have existed if we didn't believe carbon emissions caused global warming. And we had political support, the ear of government, big budgets, and we felt fairly important and useful (well, I did anyway). It was great. We were working to save the planet! "But starting in about 2000, the evidence. . . fell away or reversed. Are global warming activists going to kill Africa? Gee, no importation of products from Africa...no travel there....how on earth does this benefit Africans? Recently, Tesco announced that as part of its plan to be a responsible corporate citizen and save the planet, it had dramatically cut the amount of fresh produce it would fly in from Africa, and buy more locally. Do you think the Africans were grateful? Plus, the scientific debate is over. Only paid-off, quack scientists and Neanderthal media types like Rex Murphy and Margaret Wente remain in climate change denial now, but they're being left behind in the swirling dust. How arrogant can you get? There could be a terrfic debate, but one side just doesn't want it. Even among the scientists who accept man-made global warming, there is no consensus on what to do - some scientists say it is too late to do anything..and some like Bjorn Lomborg think we should focus on far more important issues like clean drinking water in Africa or on fighting AIDs in Africa.